Most homeschool parents decide that they will make one themselves. Certainly, it can’t be too hard (it’s not and there are instructions on how to do so at the link below!). But for those that would rather not hassle with making one, the next big decision sets in… which format should I choose – a wall timeline, a book timeline, timeline software or maybe even a mobile app? The question I receive most frequently, I believe, is which timeline will best suit my students’ needs. 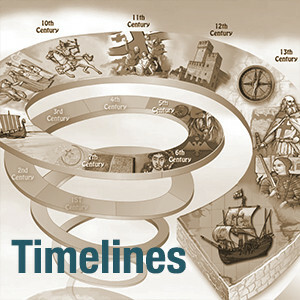 Choosing a timeline is an important and subjective decision and a tough one at that, with so many great options to choose from. However, I do believe that every home educating family needs a timeline, particularly if you have students in 4th grade or higher. Perhaps you are the crafty type. If so and if you would prefer to make your own timeline, I would love to show you how I made mine.